Jérôme Guigue has exhibited in Hamburg twice, most recently during the "Wir sind woanders" festival, as part of a 9-artist group from Paris' La Générale. The latter was originally an old factory that artists had squatted, in the middle of the Belleville District. The building, in which about 100 artists lived or worked, saw its occupants expulsed in 2007. 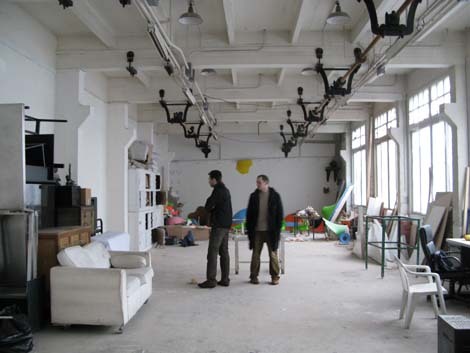 The Paris government, however, let the artists set up in an empty, former ceramic factory west of the city. Rahel Puffert paid Jérôme Guigue a visit and spoke with him about his work and about the situation at La Générale. 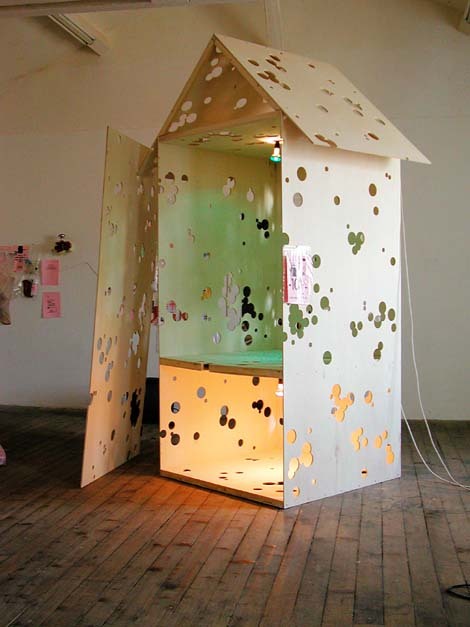 Rahel Puffert: The first work of yours I saw was this wooden house with the holes in it and I then learned about this very funny idea of a production of reduction, which I always understood as an antipode to creation, or even production in itself. Maybe you can explain that a little bit? Jérôme Guigue: I don’t think that reduction is destruction. It is rather in the protocol of reduction. The idea was to reduce physical parts of someone else´s work. RP: So, it was always in negotiation with other artists? JG: Yes. And reduction was never made without consent of the other artist. It is not a savage intervention. RP: But what happened when you asked other people? Do artists normally agree with this idea? RP: But how did you do it? I mean there are different conceivable forms or methods of reducing a work. Is it only a physical thing? JG: The target is something quantitative, in fact. So there must be an objective data of what we are reducing. For example several reductions were made about weight, others were made about length. For a video for example, it can be made with duration. RP: But then the work of art is changed for ever? RP: Okay, and that’s the idea, too. JG: Yes, it is a definite loss. It is like, if you have a big flat and one day you can’t afford the flat anymore. You have to make that kind of decision: renting one of the rooms, for example. Or you lose something like your hand or your eye, and you have to keep living. RP: But if you’re saying it is about weight, does that mean it’s a sculptural approach? JG: Yes, the first reduced pieces were sculptures. RP: But then this social aspect of it was an interest of yours as well? You know, trying to find out what happens when you come to somebody and you have to negotiate, and so on. Is this something where you are trying to work on the value of art? Is that a topic of yours? JG: This is tricky, because... No, my first idea was... I always think of art bought by the museums, the institutions, the FRAC (Fonds Regional d'Art Contemporain) and so on, who collect a lot of works that we will have no interest in 10 years, maybe. For example when the French FRAC started they collected a lot of figurative painting and local artists’ works, you know, who have some kind of ...big painting, big dusty paintings of the eighties and then they couldn’t show them anymore, because nobody is interested in that kind of work anymore. So it’s rather an ecological consideration to make space. The economy is about the conservation of art. For example, at La Défence there is a very big basement that is full with parts of the Louvre collection and they don’t know what to do with it. They can’t destroy it, because it’s art. One idea with reduction was to make some space in the collection. RP: And does that derive from the idea that there is too much art production? JG: The main question is: why make things that are so encombering? What will we do with them? RP: Because there are a lot of artists who are presented in a gigantic way. They start with small works, but as soon as they get a little bit more famous, the dimension grows and everything gets bigger and bigger. And so your concept is just the other way around: let’s start with taking things away. JG: And to make a little place in the stock that we have. RP: But is the space you are creating then available for other art, or is it just the idea of having more space, because we need more space? JG: I don’t know really. The main idea is it will be still be a work of yours, but it will be lighter, more easy to carry. However, for the artists who were involved in reductions, the question came up: what’s gonna happen if I cut it. RP: And also I see, that there is one strain of dealing with the immaterial aspect of the work. Immateriality is something you cannot reduce. JG: Yes, but it is a very materialistic consideration. That is an interesting point. Afterwards it becomes a collective work, you know. If you bring me your work, we make a reduction, it is a collective piece of you and me then. RP: But at the same time it’s a test. You are testing, how much is really necessary for showing the work. Do you want to change the work or do you want to test how much you need to keep? JG: That depends of the case. But we were always trying to find, what can really change the comprehension of the work. That is one of the main motivations here. Because a work of art, that gets loss is still a work of art. The motivation of making reduction is about this material aspect: is it important or not? Let’s see... That’s why I started with this work. RP: I remember that once you made this reduction piece in the exhibition of Michel Chevalier 2004 and you did this reduction and you took 50% off everything. So one of his sculptures was hung 50% higher, and then the slide show reduced to 50%. And then you put all these stickers on them on which it was written 50%. And there somthing else was coming up, it was a little bit like the reductions you have in the consumerist world like in the supermarkets: after a while, things lose their value, so that you mark down the price. So, is this an economic reference? So that value is going down overtime? JG: Yes that’s the folkloristic aspect of this work.Space pégant RP: Then this other work of yours, you’ve been working on for a long time now, is the Space pégant. Is there any connection to this idea of reduction or is that a totally different approach? RP: Maybe you can explain it first, so that we know, what we are talking about. JG: About Space pégant? 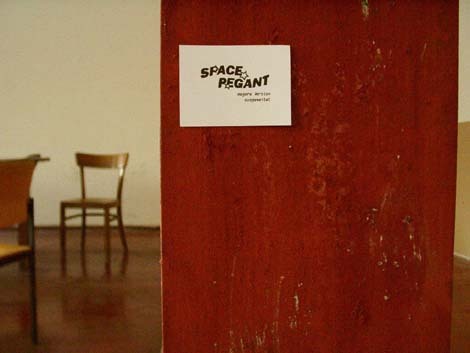 Space pégant is made with the idea of modifying the behaviour of space, but not in a visible manner. It’s just making everything you can touch sticky. „Pégant“ is a word in French southern slang about this feeling of stickyness. For example in Summer, the trees become „pégant“, because of their „bleeding“. Space pégant shall affect every object that is in the room, objects like computer mouses, the backside of a table and the other artists works, and everything you can touch should be sticky. But this is difficult to accomplish, because of the limitations of curators and other artists participating in the exhibition or other people involved in the Space pégant context. It is a pretty demanding situation. So what is realized is most of the time a light version of Space pégant that concerns the floor and sometimes the drinks. As a result it is always a preview to what Space pégant could be. RP: And this feeling of stickyness is most of the time experienced as a little bit uncomfortable, isn’t it? JG: Depends on the people. Some people are really excited of this feeling. RP: But it doesn’t really fit into the concept of the white cube being nice, properly and very clear and clean, because there some dirtyness coming in. So, is this one aspect to intervene in the normal way of presenting art? ... Or the conventions of presenting? JG: Yes, you cannot escape from a Space pégant, only if you leave the exhibition. That’s something interesting about this work, because I think, if you don’t like a picture or a video or you don’t like anything in an exhibition, you go somewhere else, but Space pégant is a little bit like a nightmare, a spreading nightmare, you can’t avoid sickness in Space pégant. "Space pégant, magere version ausgeweitet" 2005, label. "Space pégant, magere version ausgeweitet" 2005, floor. RP: Did you try to do it in more official spaces, like galleries or...? JG: Yes, yes. In collective exhibitions. One of my decisions is not to leave Space pégant alone. It needs to be among the works and the things, because it’s not a formalist approach. It is interesting as a constraint, like you said, something working as discomfort. And with this question of discomfort or disagreement, maybe there is a connexion with reduction. RP: That’s what I thought. And also that your approach is always about a little disturbance. You intervene and things are not happening normally and people are really confronted with something. And again you have a communicative aspect there, because people who experience this discomfort have to reflect on it. Even together. It is creating a form of communication within an art space, isn’t it? JG: I don’t know, if it is really about communication, but it’s about feeling, it is about the sensitive aspect. JG: But, yes, the idea of changing something of the normal situation is exciting for me in my work. RP: And again here you can’t really see it. Is that important for you? JG: Theoretically, you can’t, because it’s about the touch, about the haptic, but finally the floor is so dirty after Space pégant that it remains as something visible. RP: And you have to clear everything up afterwards. 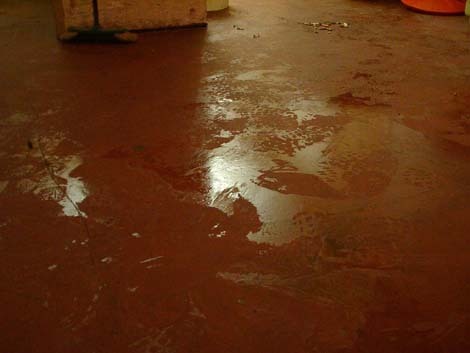 JG: Yes, the idea is that Space pégant happens at the vernissage and the floor remains dirty for the rest of the exhibition and you can see a video of what happened. JG: Yes, contextual. So the documentation is very important, of course. For example if you see a reduced piece for the first time, you can’t understand in the very beginning, because it has been reduced! So one the exigences of reduction is that the work has been shown in its physical integrity before, so there is a protocoll. The documentation is important, otherwise it would be understood in a different way. The documentation is important to my work to make sense. It is part of the work, really. RP: And would you exhibit just the documentation or is it always part of it? JG: Well, it depends. Most of the time people like to invite me for Space pégant, because it’s easy and cheap and it’s spectacular, too. So you can use a big space for cheap money. But there are disappointments, because if you clean it up, it becomes sometimes horrible, because the more you clean, the more it sticks. RP: If you are thinking of developing a new work, would you always consider this idea of reduction? So that you yourself may just produce works that can’t be reduced? JG: If I do works that can’t be reduced? JG: Well, the first longboard was made for an exhibition in Mulhouse. It was formally a usual longboard. But only there was a change in the material the board was made of. It was made of plasterboard. And then the longboard was ready to be used in the exhibition. And my question was: How long will it remain intact? As a matter of fact, it was broken before I could take a photograph, really fast. This was the first one. And then I considered that this modification is a definite modification of this longboard. It was changing its state. First, when it was intact, it was Longboard-1.0 and when it was broken, it became Longboard-1.1. And for the next longboards I took them with me and I visited skaters in a skater place and I waited for someone to ask me to try it. So, the part of this work was Longboard-2.0 and I made videos of me waiting for people and then when they tried it. So now. From the 2.0 the video document 2.0 part and the rest of the broken board is the n.1. The current version is Longboard-6.0. RP: Okay. But what did you expect? Was it about the reaction of the people or was it about this idea of modification of the object? JG: The main idea was we are going to have fun. But very shortly, maybe just one fraction of a second. Put the foot on it and it breaks. RP: But is it the experience you are pointing at? This experience of this very short enjoyment? JG: I was interested in making interactive art, but only in one interaction. One definite interaction. RP: So, on the one hand it is longterm piece, because you have to wait, and on the very other hand it is very short, because the interaction is minimal. JG: That’s what makes the video a little funny, you know. 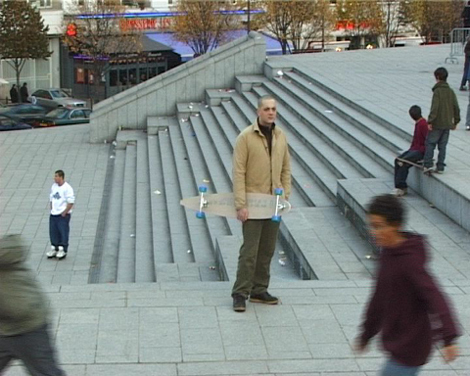 "Longboard-2.0" 2004, still from video. RP: So, how did people react? JG: Oh well, it depends, usually the video is cut, it it is finished just when the board is broken. And then I take the board and say: it’s okay, I smile and I just go. I don’t make friends afterwards. But sometimes people are worried: What did I do? I broke it! Is he going to ask for money or something? I leave very quickly, because I don’t want to give explanations. JG: Oh, because it’s not necessary, I think. JG: Yes, and I leave them with this experience as much as possible. RP: Ok. Is this work adressing these people or adressing the audience? JG: Maybe both. And you know, longboard riding is a very specific practice. With few people and little communities all over the world and working a lot with the websites and „you tube“ and so on. So, if I begin to explain what I am doing to those people, they can communicate very fast and it will waste my work. So I prefer to keep it as mysterious as possible and don’t involve longboard community people with this. Or I will be expected in the next competition...Hehe, will you come? And that would be boring. RP: So, it’s a lot about the surprise. La Générale RP: We are now sitting here in „La Générale deux“. JG: La Génerale en manufacture. RP: Maybe you can tell me a little bit about the situation of artists living here in Paris in general, because it is obviously not so easy to exist here and it seems that it is necessary to build up an infrastructure. JG: Yes, La Générale of Belleville was resulted from this situation. I learned recently that Paris is the city that has more galleries than even NY or London. So, there is a very big artistic activity in Paris, but it has became so expensive that artists increasingly have to find a side solution to live and to work. And La Générale was symptomatc of this situation. And there are .. the city hall has studios and so on, but they are too few for the masses of artists living and working here. View from an atelier, la Générale en Manufacture, Sévres 2008. RP: But do you think this situation of building up new conditions is a chance for you to establish maybe another system of working together or of presenting art and so on. Do you see it as an alternative to the art market system, which involves a lot of repression? JG: I am not sure, Rahel, because many artists working here are making a career with galleries and others want to. People come to make exhibitions or more spontaneous, more selfmade projects here, but finally the place is not that much an alternative for work, but rather the way to work. RP: And what’s your attitude towards this situation or towards the demands of the market on the one hand side and your being involved in establishing something else? Is there a strict seperation between the two for you? JG: No. I don’t think so. But it is a possibility for making another kind of exhibition, for sure. But many young curators who are coming to manage an exhibition are doing things similar to what you could see everywhere else. The activist dimension is not so strong. RP: But do you see it, for yourself, as a chance to develop different ways of presenting, different forms...? JG: Yes, in La Générale we were managing an art exhibition space with Luc Arasse and we were planning nothing like an aethetic line, but really responding to the demands, and wanted to be spontaneous and quick and give people the possibilities of making a quick project. And it was interesting for this. RP: What do you think is state of art at the moment? Is it a good time for art? JG: I don’t know. I don’t have no comparison, I haven’t lived for 50 years or 100 years. But I think the situation in France is really changing now since 10 years, and now it is really sensible. That the French tradition of making the big artist careers only in the museums and art center in an institutional way is deeply changing. And now we are conforming more and more to market demands. And this is formulated and wanted by the authorities. It is a political choice and that doesn’t only lead to good things, of course. For example in Germany the first and the main collectors and owners of art are banks and companies and there is a tradition for this that artists can manage and evaluate and considerate, but in France this is quite new and it is quite overdone. JG: La Générale, as I said, is rather an exception as a tool than as an idea, and that’s really important, because people often make that confusion. But the will of the people in Belleville, the common will was to keep a tool and a possibility to work freely and easily and commonly in a way, and indvidually, too. RP: And it worked out? Because normally you say, ah, artists are so individualistic, they have their strong egos and they can’t work together, there is no solidarity and so on. JG: Yes but there is a solidarity of strong egos. That can be the conclusion. RP: Thank you very much, Jérôme.